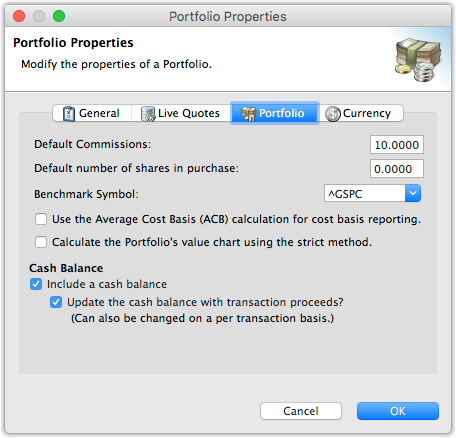 In addition to the “General” (name and description) properties and “Live Quote” properties, a StockMarketEye portfolio has a number of other properties that can be changed in the “Portfolio Properties” window. 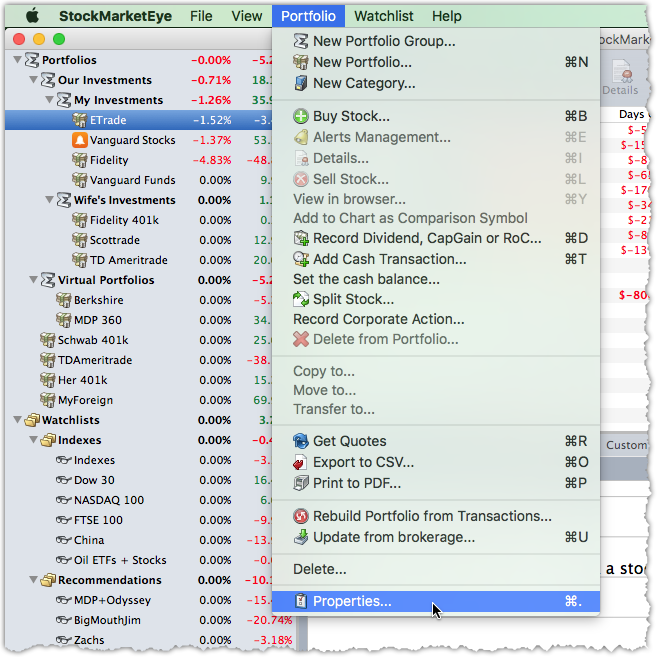 In the “Portfolio Properties” window, the “Portfolio” tab allows you to configure some of the general aspects of the portfolio. Default Commissions - This value is the default costs/commissions that StockMarketEye will deduct for each buy/sell transaction in this portfolio. Typically your brokerage will charge a per transaction commission every time you buy or sell stock. This can be anywhere from $5 to $25 and you can set this value here. You can also change this value when you enter the buy or sell transaction, in case the commissions are not fixed, but calculated. Default number of shares in purchase: - This value will be used to set the default number of shares in the buy transaction window. If the value is 0, the shares in the buy transaction window will not be set. The value specified here in the Properties is only the value that is initially put in the Shares field of the buy transaction window. The Shares field can be changed afterwards in the buy transaction window. Benchmark Symbol - Select which symbol you’d like to use for the benchmark symbol in this portfolio. The benchmark symbol is used in the “Benchmark” columns. You can select one of the indexes in the list or enter your own symbol (ex. SPY). Use the Average Cost Basis (ACB) calculation for cost basis reporting - See the section on Cost Basis Calculations for more details. Calculate the Portfolio’s value chart using the strict method - The market value chart of the portfolio is a chart of the closing value of your portfolio over time. Movement in the chart is due to the price movement of your holdings as well as any cash flows into/out of your portfolio. By default, the daily values used in the chart are calculated by taking the current portfolio and working backwards in time. For each previous day, the value of the portfolio at close is calcualted using historical quotes, then any transactions that occurred on that day are reversed. With the “strict” method option selected, the daily values used in the chart are calculated by building a virtual portfolio from scratch from the transactions. For each day, the transactions that occurred on that day are applied to the portfolio and then the value of the portfolio at close is calculated using historical quotes. The “strict” method is technically more accurate, but can result in large discrepancies if there are any missing historical quotes for stocks or currencies used in the daily valuation. The default method can also be affected by missing historical quotes, but does a better job of remaining more in-line with the current valuation of the portfolio. Cash Balance - Each portfolio contains a cash balance line, just above the “Total” line. This value represents the un-invested funds you have in your account. Some brokerages keep your un-invested funds in a money market account, others will keep it in an interest bearing account. The “Cash” line represents the un-invested portion of your portfolio, whether it is actually in a money market fund or an interest bearing account. You can read more about the cash balance in the section, Managing your Cash Balance. Un-check this option if you do not want to have a “Cash” line in your portfolio. In this case, the cash balance will not be actively maintained. A portfolio that does not use the cash balance is referred to as an invested-capital portfolio. Include a cash balance - This option tells StockMarketEye whether it should maintain and display the cash balance line. You may want to uncheck this option if you are setting up a virtual portfolio without a cash portion. Typically for a brokerage account, you will want to have this option checked. Update the cash balance with transaction proceeds? - This option tells StockMarketEye that it should add/subtract the proceeds of transactions to/from the cash balance. You can also change this on a per transaction basis if needed, using the “Update the cash balance?” option in the buy/sell/dividend/etc windows. The “Currency” tab allows you to configure the currency used for the Total and Cash lines of the portfolio. 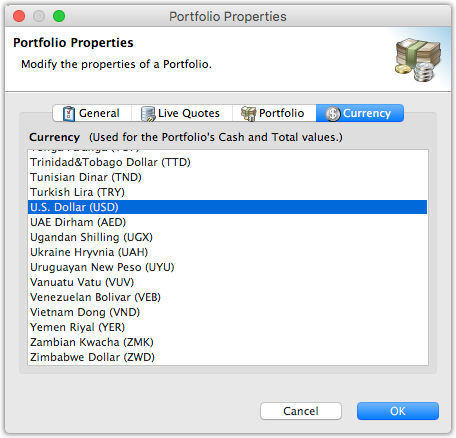 Individual items in the portfolio can be denominated in other currencies. However, the currency used for portfolio’s total and cash values is determined with this property. If you change this value, you may also want to change the “Currency Settings” found in the general Preferences window.